Professional Roofing specializes in installing high quality low slope and flat roofing commercial roofs. Our trained team is ready to install EPDM, TPO, Metal, and PVC roofing systems to meet your companies needs. 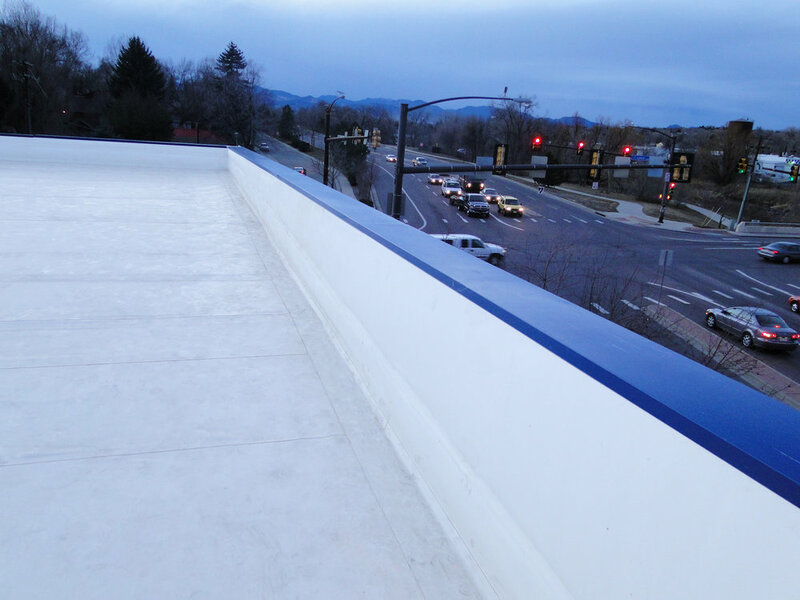 Our commercial roofing materials come with 15-20 year manufacturer warranties, as well as with Professional Roofing's 7 year workmanship warranty. If you have a leak or any question about the condition of your commercial roof, give us a call! We would love to perform a free inspection to evaluate the condition of your roof and will work with you to troubleshoot any leaks you might have! Contact us for a free estimate today! We specialize in pitched slope residential roof replacements. Our team installs top of the line products from GAF, Certainteed, Tamko, and DaVinci and was the first GAF Certified Master Elite Contractor in Colorado. Since then, we've added certifications as a TamkoPro Installer, CertainTeed Master Shingle Applicator, among others. More than anything, our team focuses on working with each client to protect their homes throughout the roofing process. We will clearly communicate about what to expect, follow through on our word, and complete your project in a timely manner. If you have any questions throughout, give us a call! Our service technicians and inspectors are ready to help you protect your home by repairing leaks and extending the lifetime of your roof! Whether we need to rework a valley, replace new custom bent chimney flashing, replace a skylight, install a new pipe boot, or any other repair - Professional Roofing is ready to stop your leaks and protect your home. Give our team a call or request an estimate online! We install seamless residential and commercial gutters, heat tape, and gutter guards to protect your home from excess runoff, ice dams, and gutter clogs! Our team will work with you to determine which types of gutter and accessories are right for your home. Professional Roofing is also ready to replace and paint siding, repair fascia boards, among other exteriors that go along with your roofing project. Give us a call! We'd love to talk through these repair options with you.